So you’ve worked out how much room your chickens need, designed your chicken coop and your chickens, chicks, or pullets are on the way. We can still remember the excitement of waiting for the delivery of our new chickens- our first questions was: I wonder how long it will be until they lay their first eggs! Are you wondering what you need to do when they first arrive and how you can get them off to the best possible start in life? 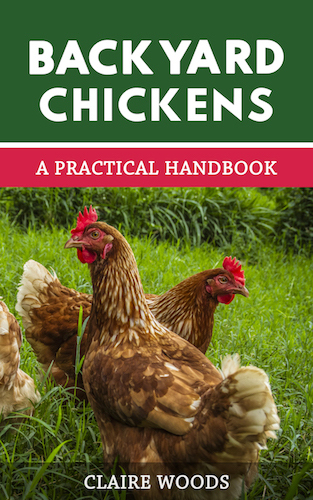 Well look no further, because we’ve wrote exactly what we did when we received our 18 week old hens and how we got them laying sooner rather than later. Just before we get into the meat and bones of this article, it’s assumed that you don’t currently have any chickens at home- as introducing new chickens to an existing flock is a completely different process. We will be writing how to do this in an upcoming blog post– the article has now been written. What To Do When Your Chickens First Arrive? Although the temptation is for you to be very loud and excited when they first arrive, this is the worst thing you can do. Your chickens will be very confused and daunted after their journey and they will be afraid of any loud noises. Read more about transporting chickens humanely. The best thing you can do is carry them into their coop and lock them in there. They will normally be delivered inside a cardboard box, make sure to leave them inside the cardboard box and just place the box inside the coop. You can then open the top flap of the cardboard box so the chickens can leave the box once they are feeling confident enough. The only other thing inside the coop at this point should be some water and pellets or crumbs which can be spread on the floor. Check up on your chickens in a few hours and you will find they have probably left their cardboard box and are happily roosting together. If they are still inside the cardboard box lift them out one-by-one and place them on the roosting bars. The reason behind leaving them locked in their coop for the first 24 hours is that they will realise that the coop is their home. Then when you eventually let them out into the pen, they will happily return to the coop to roost in the evenings. In our experience chickens who haven’t been kept in the coop at the start, tend to be stubborn and don’t return to their coop in the evenings without ‘persuasion’! Once they’ve spent 24 hours in their coop it’s time to introduce them to their pen/run for the first time. This is always an exciting moment and a great opportunity to get a really good view of your new chickens. It’s important at this point to say don’t force your chickens out of their coop. All you need to do is open their coop door and wait. For an added incentive you can spread some feed in their pen along with fresh water. If you’re not sure what to feed them, read our beginners guide to feeding chickens. The more curious chickens will leave the coop first and explore but within a few minutes the rest of the flock should come out and join them. If after a few hours the flock are still inside the coop give them a gentle push out into the pen. You can leave your chickens for the rest of the day now to explore their new environment and get comfortable! When it starts to get dark its important you go back outside and make sure your chickens are inside their coop. We’ve always found that by getting the chickens use to the coop (before they are allowed in the pen) they are much more likely to go back into the coop when it’s dusk. If you’re chickens aren’t in their coop yet gently move them towards the coop- we do this by using a large sheet of wood (8×6 foot). Have a person at either end of the wood and drag the wood across the floor- moving the chickens back towards their coop. It’s important that any move you make around the chickens is calm and slow; don’t charge at them with the wood whatever you do! We found this great video if you need other creative ways to catch your chickens. Or if you don’t want to watch the video, look at Tips for Catching Chickens. A great question at this point which people ask is: “is all this necessary if I’m planning on letting my chickens free range”? How Long Until Your Chickens Settle In? You may find that for the following week or so your chickens need to be encouraged to leave the coop in the morning and go back to it during dusk. As previously mentioned, to do this, just leave the coop door open and sprinkle food out in the pen. After a week or so they will leave and return to their coop on their own and your chickens will be settling in nicely. It’s at this point that if you are planning on letting your chickens free range, you can take down your temporary pen and let them roam! Again though, after their first day of free ranging, make sure they return back to their coop during the evening. Interested in learning more about the benefits of keep free range chickens? They should dig for bugs and merrily cluck as they do so! Oh speaking of clucking, they should begin to cluck to each other more often. Another great sign is, they will take dust baths. This behaviour will be in stark contrast to unhappy and scared hens. Unhappy hens will pace around constantly and are very noisy. You will learn to notice the difference between a scared squawk and a happy cluck. You might be surprised to find that chickens can actually recognise their owners dogs- read more here. 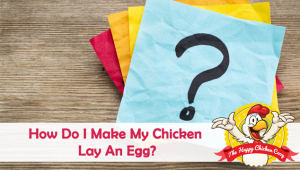 When Will My Chickens Start Laying Eggs? The answer to this question mainly depends on both the breed and age of the chickens which you’ve bought. Some breeds, such as Buff Orpingtons, can lay over 200 eggs per year whereas other breeds, such as, Silkies don’t lay that many (up to 100 eggs per year). 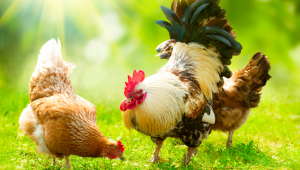 Read more about breeds in our Best Beginner Chicken Breeds article. Of course, the other factor is age. If you’ve purchased a started pullet (a hen that’s between 15-22 weeks old) then you should find within 3-4 weeks of them arriving you will have your first egg! You will probably find the first few eggs will have soft shells and might be slightly odd shapes, this will settle down after a week or so- if this continues read what to feed them. However, if you’ve purchased matured chickens (aged 1 year old +) you will find they start laying sooner. Give them several days to settle in and you should find they start laying again. Also you might find that they start laying as soon as they arrive and then after a few days stop laying. This is normal- give them a few days to settle in and they should start laying again. As a general rule of thumb, pure breed pullets (Rhode Islands, Plymouth Rocks, Leghorns etc.) will start to lay eggs from around 20 weeks whereas hybrid pullets will start at around 18 week old. One last thing to remember is the time of year greatly effects when your chickens will start laying. If you get your chickens during the winter then it will be a lot longer until they start laying- however get your chickens in the spring and they should be up and laying in no time! What if I’m only going to start out w/9 chicks? What is your recommendation for placing the heat lamp for them? Do you leave the chicks in box they came in to settle down for a short time then introduce them to water/feed? Your video was extremely helpful it just started past the age I’ll be getting mine. I look forward to hearing from you. When are your chicks arriving? So glad the website is helping you. It’s great to hear how friendly he is towards you already! I’m bringing home chicks for the first time, and I don’t know what I need. do you have a list or suggestions? First of all good luck and enjoy it whilst they are still young and fluffy- they grow up so fast! This is a great article! I have never had chickens and today I got 4! I am so excited but also a bit nervous. Your advice has been so helpful and full of great tips. It’s really hard to know exactly what to do so thank you so much for all your help. More info is always welcome! Congratulations on making the hardest step and I’m so happy the website is helping you 🙂 ! 6 days ago i purchased my first 5 chickens.. 3 warrens hens, a black rock and a buff sussex.. i have had 4 eggs up til now.. which is fine i presume for they are settling in. I have a coop (4ft x 6ft – 3 boxes) and a run (5ft x 8ft ) within a paddock @ 1/2 acre big… i keep the chickens in the coop over night… one of the edges of the paddock is post and rail with a thin wire along the bottom of the fence – there are gaps which my lovely girls could get through… i am alittle anxious about letting them out of the run into the paddock….are chickens likely to wander too far from the coop? or are they normal satisfied with the lush green paddock! Congratulations and its great to hear they are laying eggs already. First of all congratulations on getting chickens and I’m sure you will enjoy them! When you open the coop up in the morning lift them out and then lock the coop so they have to stay into the pen area. Make sure to stay with them for the first hour or so and give them treats to settle them down. So what am I doing wrong . It really depends on how old they are and their diet. Make sure they are fed a high protein layers pellet and when they reach around 20-24 weeks of age they should start laying! I have just purchased 6 chooks that are 16 months old. I am keeping them in the chookhouse at the moment. I would keep them in their coop for the first 24 hours so they can get use to their new surroundings. Then let them out into the run. I just brought a new hen to my coop and there attacking her! Help my coop to being peaceful again!!! I just brought home 4 hens yesterday afternoon. They’ve stayed in the corner on the ground since then and do not seem to have ventured upstairs to roost or anything. They just keep hiding in the corner on the ground. The food and water is near the door at the opposite end. Are they okay? It sounds to me like they just need some gentle encouragement. Howdy, everyone. Thought I’d comment. I first started with 16 1st-year (adult) 14 Rhode Island Reds (great layers, not broodie at all) and 2 Ira Browns. My plan in September is to buy 50 Rhode Is. Reds chicks. And place them in the new coop warmer & run area at the right age. 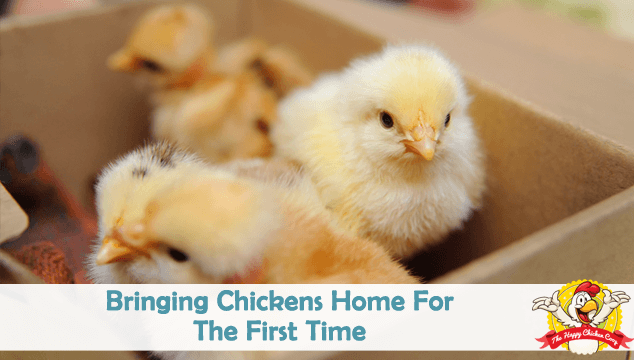 1) chickens are nervous creatures when relocated to a new home. They stop laying and don’t move much…give ’em time…They start to act and lay normally once comfortable with their new home. 3) depending on what breed you get will determine all sorts of things: personality, laying quantity, flock behavioral temperament, etc. 4) I never had to train my hens to go into the coop. Once the sun starts to go down and one or two go in the coop the rest all instinctively follow, (unless you leave a light on for them in the winter, as I do, to extend the feeding time), then they’ll stay out longer. 5) for health reasons, I find it best to feed my flock 16% layer crumble vs. pellets (crumble lasts longer, ergo, is cheaper in the long run). In place of pellets, I also give them the scratch grains, they love it. But go easy on the grains…too much corn tends to scrape their insides, leaving blood streaks on the eggs. If you see that, just back off on the frequency at which you give it to them. Also, scratch grains make awesome feed for the local birds, so I fill up my birds feeders with it for the wild birds. It’s actually about 66% cheaper than regular wild bird seed from any store. Just a few thoughts and enjoy your flock! Thank you so much for taking the time to share this thoughtful comment- there is a lot of great advice in here! I just got 10 leghorn’s yesterday. I converted an old play house to make a nice big coop. When I put the chicken’s in it yesterday they calmed down very quickly. 1 chicken left me an egg within 2 hours. How long should I leave them in their new coop? I do not have a fenced run. The chicken’s are 1 year old. I don’t want them to run off. 10 leghorn’s and 1 red rooster. Personally, when I got my hens for the first time I kept them in the coop for 24 hours before letting them out. That seemed to do the trick! It really shouldn’t no! I’ve never heard of anyone hurting their hen through using the leg wire. Personally I prefer just picking them up off the perch but if this isn’t possible then the leg wire is fine. Normally you just mix the probiotics into their water. Hi there,great article, I have a question, I just got 4 young chickens 10- 12wo (2 pullet & roo dorkings and 1 light sussex pullet) I have them in their coop atm, I dont have a run attached to their coop but a separate cage, I’ve been taking them out and carrying to the cage for time in the sun and grass and putting them back in coop, at what age can i just open the coop door and let them free range and return to coop themselves (I can’t remember what i did at this age with my last chickens that I hatched lol). Should I just leave them in coop for a week then open door or are they a bit young to grasp the concept of returning home for the night? Once they are out of the heat lamp they are old enough to range outside! I am planning to buy 6 pullets in a couple of weeks 4 from one breeder and 2 from another can I get them on the same day and put in the coop together or should I get them at different times ? 2 silkies and 2 Japanese bantams from one and 2 isa Brown from another. My husband and I just purchased 4 laying Rhode Island Red hens , we traveled over 28 miles to get them and place them in their new coop when we got home.They seem relaxed and calm in the coop. We live in the south where winter is warm most of the time. Also how much laying pellets and corn chops should I give my 4 hens daily? HI there! I have just got my first 12 week sussex and banter, and am wanting a Chinese Silkie to introduce and have as a trio. Will they pick on the silkie or is it better to purchase two silkies and keep the silkies separate from the other chooks? Thanks for your amazing information! great article 🙂 , compliments ! Now I am going to get a hen from people who is already one year and a half , so I’m worried this age will be more difficult as I have noticed since I adopted another hen one month ago that was saved from the sloughterhouse , that is an ex-laying-battery chicken , where they suffer a lot and are been used as just eggmachines , also I have noticed some HUGE traumas !!! This hen is NOT HAPPY and having an unhappy hen ? yes makes me unhappy as well , I so wish I can finally see her looking for food and taking her dustbath but she does not even KNOW how to BE a chicken , al she does ? she lays down at the same old spot the entire day and night , even had to move her inside because she is not even avoiding predatory animals 🙁 , how sick is it in those industrial egg commerce ?? she gained some of her feathers already , yet she still looks so damn sad , even pethetic , I really do not know what to do , I noticed yesterday for the first time she finally ate something , all the other times i had to croptube her and ofcourse she needed medicin and other care , only now I also realised she was lonely so this afternoon I am going to get my second new hen , she should be about her age as well +- it is the same breed ! altough this kind of breed should be easy , the sussex , I find it difficult as i notice the constant noise the one I already bought constantly makes , as if she can’t exept that she has been moved and is not going to return ? it is so sad to see her like this but I hope that i can cheer her up this afternoon with a friend !!! this should do something good for her feeling , right ?? if you have some advice for placing an older hen into the coop or how to make chickens with a very bad background happy again I’d love to hear it !! p.s. : about eggs ? NO better egg then an egg from a HAPPY CHICKEN !!! freedom and shelter and food and the best ingredients ? PATIENCE AND LOVE !!! First I would read our articles on caring for disabled/old hens. It is absolutely possible to rehabilitate her. In my opinion it is best to make sure they aren’t isolated, so make sure to get another hen to accompany her. We have just moved into a new property with two chickens. The old house they had only had nesting boxes which they perched on at night. We have brought them a new hutch but they don’t seem to want to go in they are perching on old tree stumps in there run. We have just placed them in the new hutch but they came out and back on the stump… will it just take a while for them to settle? Reducing their exposure to any loud bangs and noises will help. Also make sure they are getting plenty of rest. Over the long term, they will eventually get used to being held and will be more comfortable with this. Hi we just brought home three pullets yesterday and had no idea what we were doing so we let them out of the box in our yard, didn’t introduce them to the coop first then had to chase them around like maniacs to get them back in. I’m now realizing we did it totally wrong and am scared we set our poor girls back a while. Will they be scared of us forever now? Help! They should be OK Heather! Just let them settle into the coop and then they can roam outside. Once they are roaming get them used to you by spending lots of time with them and giving them treats! One of my chicken’s crest is looking droopy does this mean there is something wrong? She has lost a few feathers on her bottom also. We have had them for 2 weeks now they seemed to have settled in well, they approach you when you go to see them, eat out of your hand and one of them (the more confident one) will let us hold her. My granddaughter got 3 baby chicks about 2 weeks ago. They have been doing fine until yesterday when one chick died. Another has died this morning and the third not looking too good. Any ideas? They are in the house, with heat lamp and food and water. Hi l just bought 4 chickens from the market in France.Is there anyway you can work out how old they are ? Hi! This was a great read. We just got our chickens and are raising them. There is a lot of good information here. It will really be nice to use it to help tame them. Good job! Thank you too! This will really help us raise our chicks. My daughter would like hens for her birthday! Would you recommend getting 3 pullets or 3 older hens or a mix – 2 older and 1 pullet / 1 older hen and 2 pullets? We’ve never had hens before. Hello I am getting chickens in 2 days ( already grown) and I’m wondering how long it will take until I can let them in the garden to run about? Can I in the morning of the day after I got them? Also when can I start stroking them and getting them used to me?